CFLs - Will They Save the Earth? 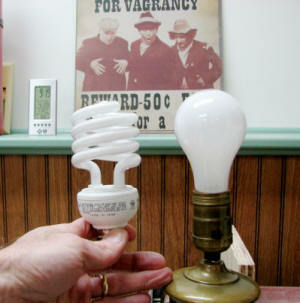 If you didn't know better, you might conclude from my writings that I detest CFL bulbs. I really don't. In fact, I rather like them for most applications. My house is full of them. What I detest is a world of bureaucrats that have determined that Edison's paradigm-changing incandescent light bulb is such an evil device that they have conspired to ban it off the face of the Earth. Based largely on fallacious, contrived "scientific" data about anthropogenic (human-caused) global warming, the wizards of smart declared that the incandescent bulb is singularly responsible for hurricanes, species migration and extinction, disease, and crop failure. It simply must go. CFL on the left, incandescent on the right. All praise be to the United Nations heads of state and to lawmakers on Capitol Hill for caring so much about little 'ol us. Can I have an "amen!" Ever eager to please, but certainly in nowise complicit, industry chieftains have fallen in line and produced that which will appease our self-appointed Earth Sentinels: the compact fluorescent light bulb. All hail. Ave CFL; we have been instructed and admonished to adore you, for you are Earth's savior. Let us honestly and practically compare the incandescent bulb to the CFL from a design, manufacturing, and lifecycle perspective - as we have practiced in the "real world" throughout our careers as engineers and technicians. From a business perspective in a free market, manufacturing any product requires an ability to sell it at a profit to customers who decide on their own to buy your widget rather than someone else's widget, or to buy no widget at all. The simpler the product is to design, manufacture, distribute, sell, and dispose of, the more attractive it is to the vast majority of consumers. From an environmental impact perspective, fewer and less toxic materials, simpler manufacturing machines and less manual labor, low bulk and light weight packaging, and long lifetime expectations equate to a greener endeavor. 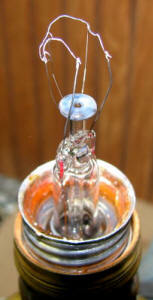 Making household light bulbs is not rocket science - at least it didn't used to be. The utter complexity of an incandescent bulb is mind-boggling. 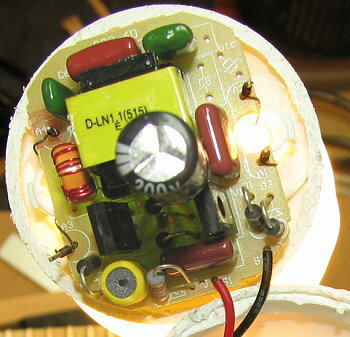 Shown to the left is the innards of a standard 60 W incandescent light bulb. Mind-boggling, isn't it? There must be more than 9 components - and that is not counting the glass bulb! Here is a list of the components that I see after removing the external glass for inspection. Total parts count - about 12 (not inc'l solder and getter). Manufacturing is likely fully automated from beginning to end, with no human intervention other than loading raw materials and performing some level of inspection at the end. A couple old movies are available on the Internet showing light bulb factories back in the early to mid 1900s where women assemble the bulbs by hand at a work station and then the glass forming and fusing is done by machine, with other workers moving the bulbs from place to place. Now let's take a look at the wonder device that has rocked our world. The entrails of a CFL bulb - so elegantly simple! For the sake of this article and to keep from having to use somebody else's copyrighted photographs, I willingly sacrificed a perfectly good 26 W (100 W equivalent) compact fluorescent bulb by cutting open the plastic base with a hacksaw. Goggles and gloves were worn during the disassembly because I would hate to spend my final days as a blind man or suffering from being poisoned by toxic ingredients getting into my blood stream through a cut. Fortunately, vast experience combined with luck resulted in no need to dispatch a HazMat team to the Blattenberger residence. Being the clever guy that I am, I managed to open the base in a way that allowed the bulb to still operate. Part of my motivation for doing the disembowelment was reading comments on a website where someone claimed that the new CFL designs used all surface mount components. I did not want to risk doing a report based on bad information. As it turns out, this newly purchased CFL is made up of nearly all leaded components. There are a couple SM resistors on the back side of the printed circuit board, though. As done for the incandescent light bulb, here is a parts list for the CFL. Total parts count - about 42 (not inc'l solder and glue). It is highly doubtful that assembly of this CFL bulb is fully automated. Since it was made in China, most likely peasants getting paid a couple bowls of rice per day sit at their work stations contemplating suicide while being forced under threat of imprisonment to meet a quota that would satisfy expectations of the benevolent beings who have mandated that the world produce no more of Edison's atrocities by the year 2012. But don't let that bother you. Otherwise, those CFLs would cost you many times more than the $3 to $6 a piece you are now paying if they were made here. Americans don't need no stinking jobs. Be happy. Be green. Notwithstanding slave labor, the manufacturing process for CFLs obviously requires much more in the way of equipment. A glass blowing machine for a simple Edison bulb does not need to be high precision or move in more than one axis. A CFL tube needs a 3-D motion machine with complex software to drive it. Both incandescents and CFLs require a furnace and/or flame to aid glass forming and fusing. 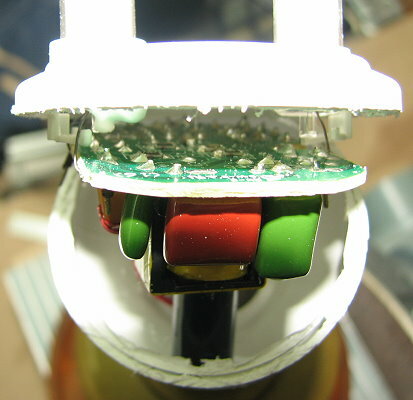 The CFL's PCB is likely hand-stuffed and soldered by reflow, which requires a very hot, fuming molten bath of solder to accommodate the high temperatures of Pb-free solders. Of course each of the electronic components has its own environment-killing trail of raw material mining and processing, manufacturing processing, packaging and greenhouse gas producing transportation costs. Testing an incandescent is a simple momentary contact, go-no-go procedure. Testing a CFL requires a test station populated with equipment of greater complexity since they must meet current waveform and EMI regulations. I did not find any data on the scrap rate of CFLs versus Edison bulbs, but you have to believe CFLs are more likely to be DOA or experience infant mortality in the factory. While on the topic of EMI, when was the last time your incandescent bulb interfered with anything due to electrical noise being generated internally? On rare occasions I have literally heard the filament of an incandescent bulb make an audible hum when being used with a rheostat dimmer. I have never personally experienced any electrical interference from a CFL, but I have had them scream like a banshee when used with a dimmer (well, maybe not like a banshee, but loudly). However, since inquiring minds want to know, I laid my oscilloscope probe next to the traces for the transformer on the PCB to sniff out a signal. 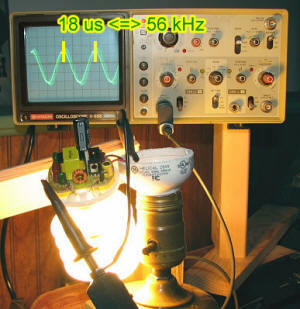 It measured to be a 56 kHz sine wave (no attempt to measure voltage was made). What operates at 56 kHz that might be affected? Nothing that I could find in a Google search. It apparently is a common switching power supply frequency. You might not want to use one in a light fixture near where you are testing unshielded circuits, though, because there is absolutely no shielding in the base of the bulb. If you see a blip on the spectrum analyzer at around 56 kHz, turn off the lights to see if it goes away. As for average lifetime of a compact fluorescent versus an incandescent bulb, real-world numbers are typically vastly different than laboratory numbers. Specsmanship driven by politics undoubtedly favored higher numbers for the CFL bulb and lower numbers for the Edison bulb. I have had incandescents last many years, and have had at least three CFLs fail in the few years I have been using them extensively. 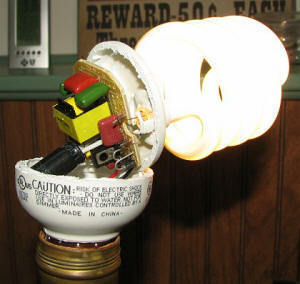 One CFL failure was due to a light fixture globe pressing against the gas tube and cracking it at the base. CFLs often do not fit handily into older light fixtures. Maybe newer fixtures are designed to allow more space for bulbs, especially in the z-axis. The Internet is full of accounts of people who are sorely disappointed in the premature failure rate of CFLs, particularly in ceiling lights in hot environments where the electronics overheat. The procedure for safe disposal of a CFL is about as ridiculous as the recommended safety steps for responding to a car accident involving an electric vehicle with a battery breach. Area evacuation, safety gloves and goggles, inhalator, masking tape, and a vacuum are needed to properly rescue the world from a CFL compromise incident. I'm not sure if mercury exposure level tags are required for emergency responders. If an incandescent bulb breaks, you sweep or vacuum up the glass and get on with life. Not to fret if you break a CFL, though, because the caring folks at the EPA have prepared this handy 3-page PDF document instructing how to survive CFL breakage. It is best to read it now and be prepared for the inevitable. Does your government love you or what? I recently wrote a Cool Product topic on a combination CFL/halogen bulb being produced by GE that solves the undesirable feature of CFLs where they emit a lower level light when first being turned on. GE engineers imbedded a halogen bulb within the curly-Q tube to provide extra light when first turned on, then switch it off after a predetermined time to save energy. Maybe some day I will get hold of one of those bulbs and do a parts count on it. They are expected to cost $6-$10 each. So, do you really believe that the CFLs are the planet saver that they are claimed to be? I am not convinced at all. I use them in ceiling lights where the bulb sockets are rated for 60 W (most are if you look) because I can use the 26 W, 100 W equivalents and end up with much more light after they warm up. I also use them in my gooseneck type workbench light since it ends up in my face sometimes while building a model airplane or repairing a watch band. Other than that, it really does not matter to me which bulb I use. If I had to use exclusively either incandescents or CFLs, Edison's miracle would win hands down. 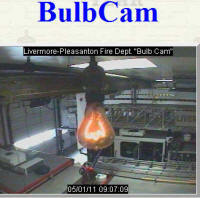 Click the pic to watch the Centennial Bulb cam in action. The Centennial Bulb, the longest burning light bulb in history, is now now in its 110th year of illumination (as of 2011). Will there be Centennial CFL?